I woke up at 8:30 this morning which was much later than I had intended to. I, exhausted from a long day and a mildly drunk from a going-away party, had accidentally set my alarm to 6:30 PM instead of AM. It was a bit late but I figured I’d give it a try. I was going to Rosemont and I wanted to see if the my new intel on the trash day there had any validity. The garbage trucks are usually active by that time but I thought there’d still be enough stuff on the streets to be worth my while. In spite of a pounding headache it ended up being one of my most entertaining trash runs of the season. There was lots of good stuff to look at and I felt optimistic that I’d make a good find. The trucks were indeed out doing their thing. I decided to use a “hurry-up” strategy where I would stop only if I felt really good about what I saw. I wanted to see as much trash as possible so that if there anything really great I’d have a better chance of getting it before the trucks did. I likened this strategy to the “hurry-up” offence in American football. When it’s nearing the end of the game and a team is playing from behind they can’t waste time standing around doing nothing. They play fast because if they don’t make quick decisions they won’t make them at all. 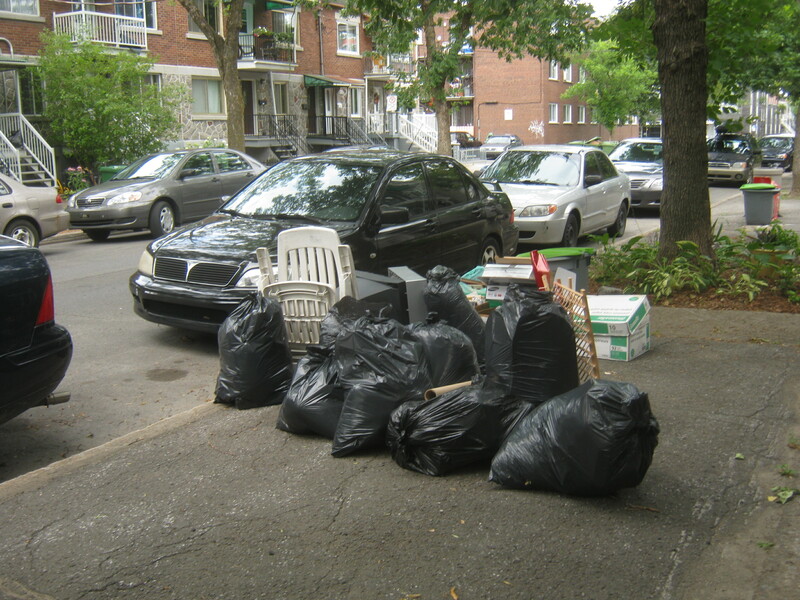 I stopped at the pile above partly because I saw some books in the recycling and partly because the trash lay in front of a beautiful single-storey home, which meant that all the garbage probably came from just one unit. 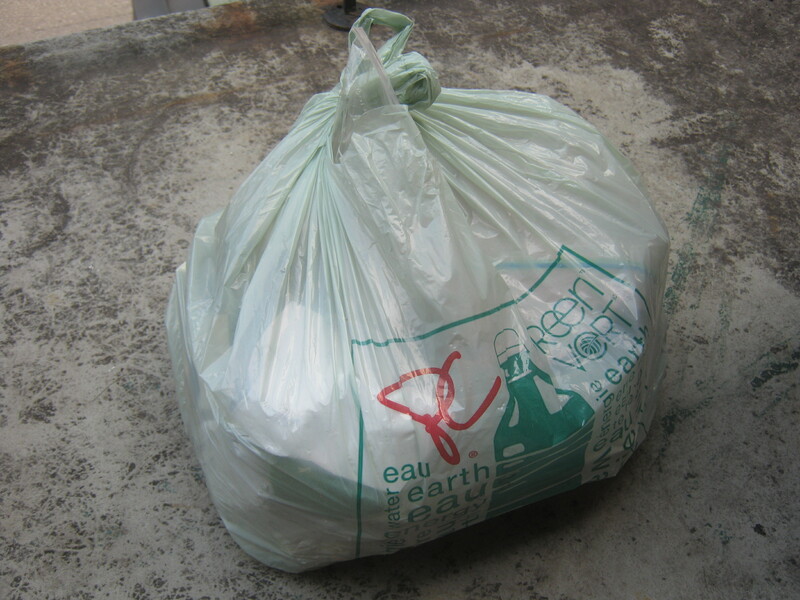 The real finds were inside the black bags, however. This shoe box and the plastic grocery bag above were filled with jewelry and little curiosities. 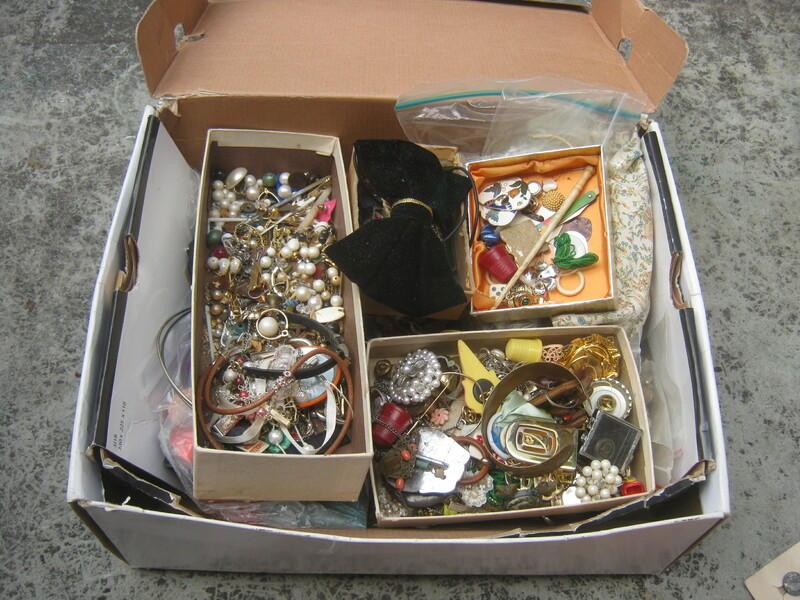 The majority of the items are old costume jewelry. There’s a bit of silver and gold but not much. My favourite part, however, is the random bric-a-brac thrown into the mix – I love looking through that kind of stuff! I imagine these things belonged to an older woman who has passed on. This is the kind of collection it takes a lifetime to accumulate. There’s a lot of interesting pieces I want to show you. I’ll start with a few of the curiosities. This is an odd piece. It’s about the size of a penny (though cut irregularly as you can see) and I think it’s made of lead. 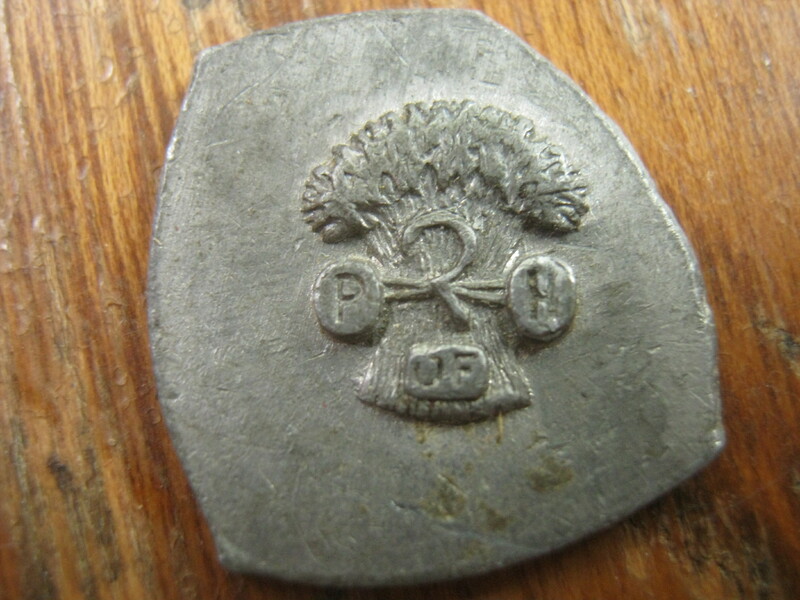 The image is a bushel of wheat with a sickle and the phrase “P of I.” Any insight on what this could be would be appreciated! 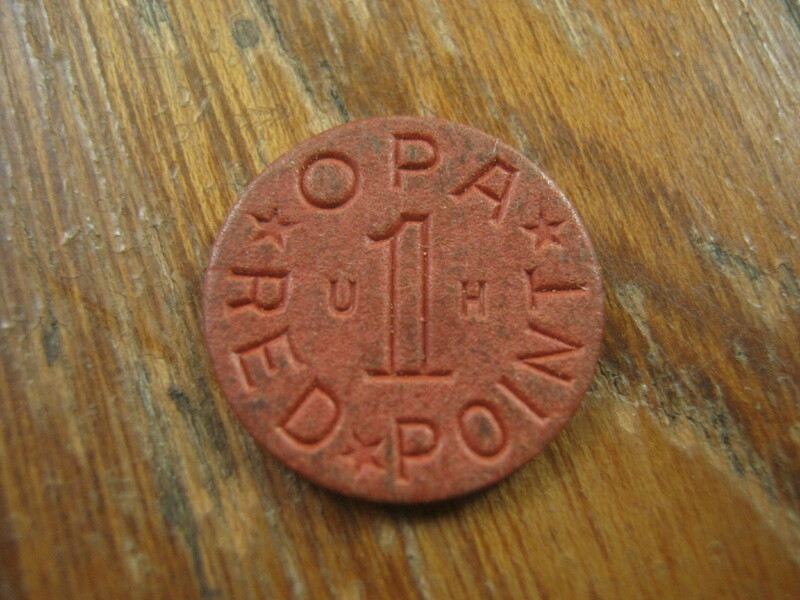 This paper coin, roughly the size of a penny, is actually a food ration token from WWII. It’s not worth a lot but it’s still pretty cool! This pin probably belonged to a WWII soldier. 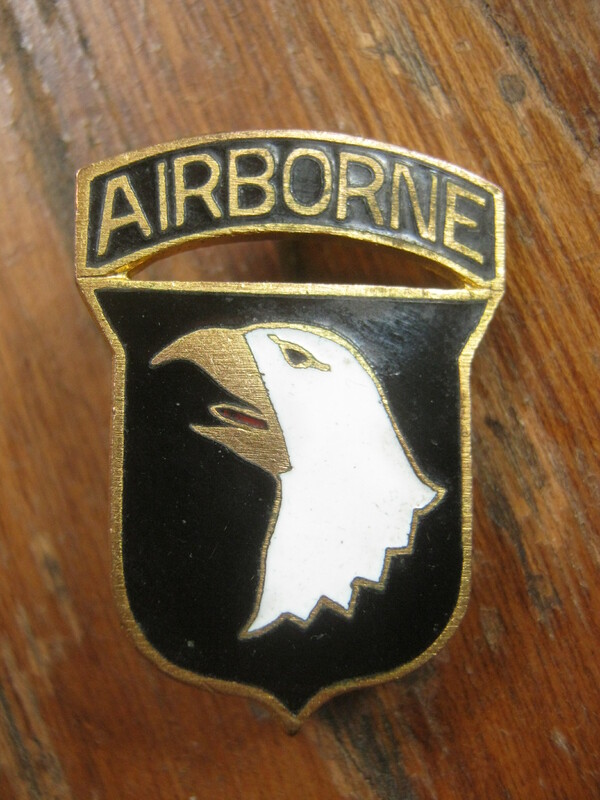 The insignia looks a lot like that of the 101st Airborne Division (US). They’ve fought in many battles (including D-day) and continue to operate to the present day. 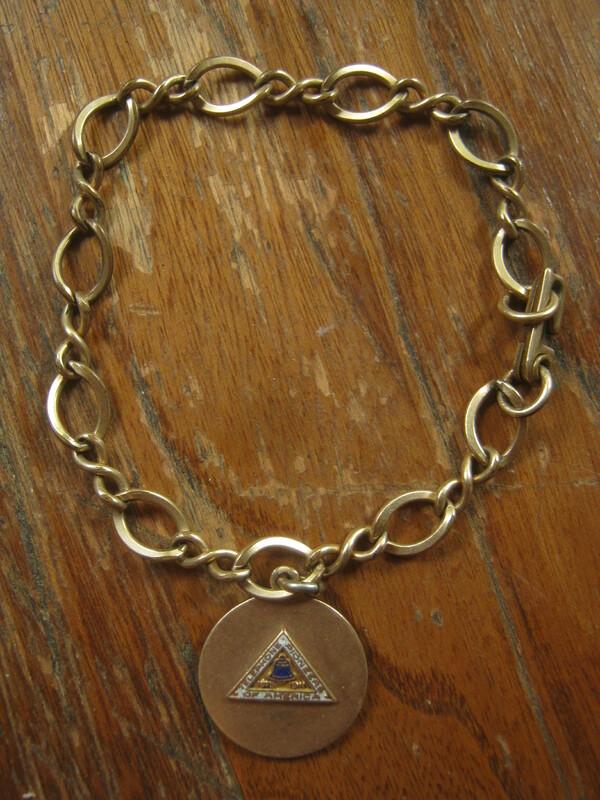 The last piece (for now) is this cool gold-filled bracelet. 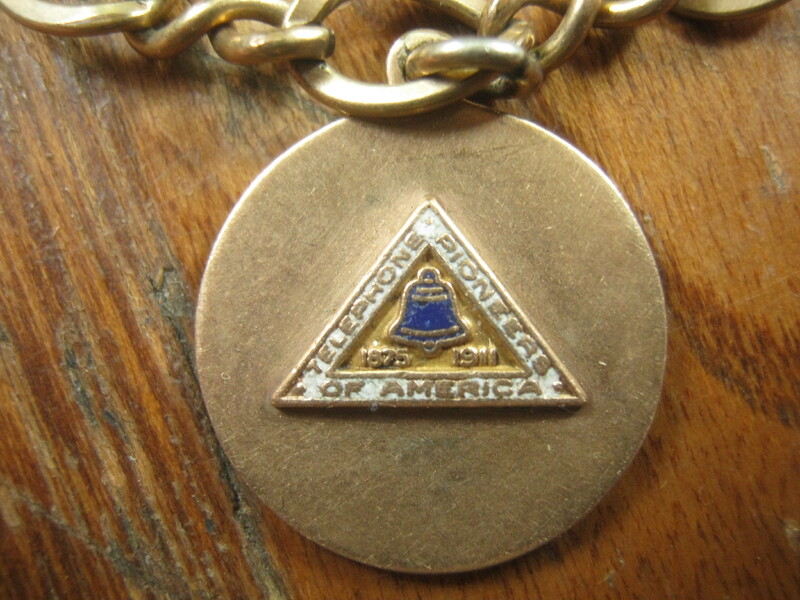 The token features the Telephone Pioneers of America, a volunteer group made up of current and former telecom workers. It’s dated 1911 though I’m not sure if it was made then or if it just commemorates a certain year. I have a bit more research to do on this one. I’m very happy with my haul. I have some work ahead of me matching earrings and such but I don’t mind that at all. I should make a decent chunk of change selling these things, most of which will go into a future yard sale. I think other people enjoy looking through this kind of stuff just as much as I do – my suitcase of jewelry and curios is always popular and seems to attract the most customers. My next yard sale should be a good one! I’ll show you more of this stuff soon enough. I hope to keep the good finds coming this afternoon as I check out a newly-discovered Thursday evening trash collection in Rosemont. I’ve been looking for an alternate to my usual Thursday evening run (Mile End) and hopefully this will provide. That is definitely the 101st airborne insignia. My late husband was a member of the 101st stationed in Germany protecting the east/west wall years before it came down. If you decide to sell that one let me know ok? I don’t have much of his military stuff left and I’m sure our daughter would love it. Thanks and happy hunting! I’d be willing to sell it, send me an email at thingsifindinthegarbage@gmail.com and we can arrange something! 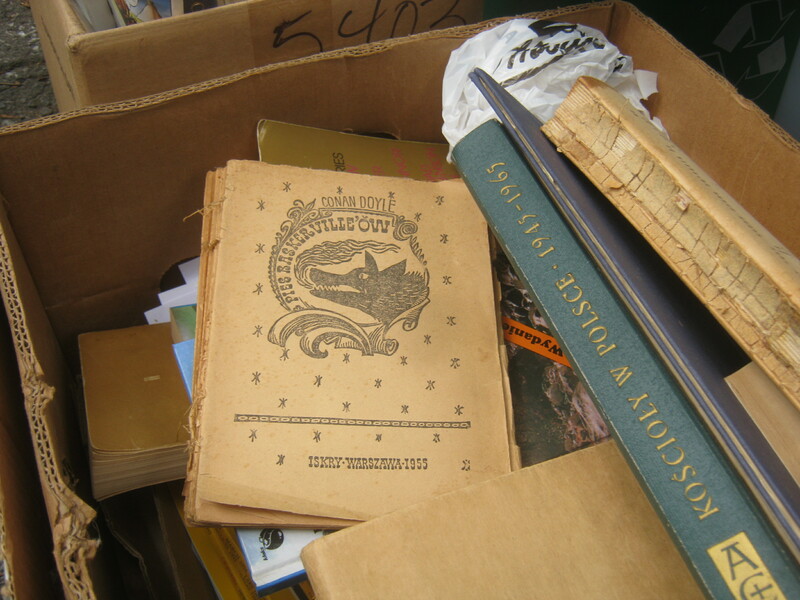 Your instincts are so right.You rescued great memorabilia right in the nick of time.Did the garbage truck pass on that street right after you took away the good stuff?It is a pity you only took one book from the box of thrown-out books.Did other people get a chance to scavenge there after you left there?I hope so. I was a few streets ahead of the truck when I saw this stuff and when I left I still didn’t see any sign of them coming. I would have taken more books but the jewelry (which took up a lot of space!) was obviously my first priority. I hope some other people got the books before they were taken away. Fortunately, at least they were in the recycling so they may end up being made into more books.